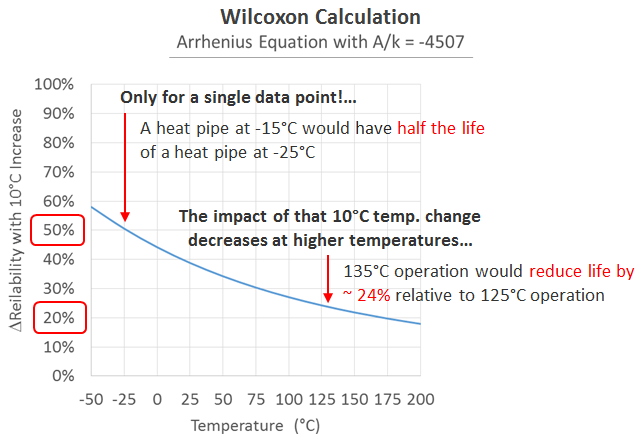 Heat Pipe Reliability – What You Know is Wrong! Last week I gave an IMAPS presentation on heat pipe reliability with Ross Wilcoxon from Rockwell Collins. Thought I’d give you the highlights in graphical form along with some comments. 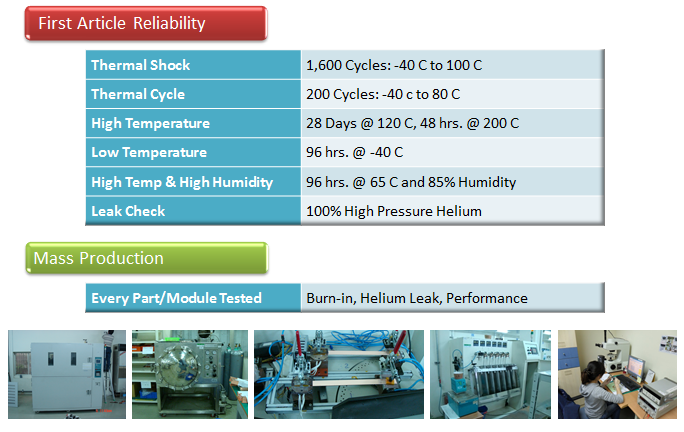 Product reliability is determined by understanding the reliability metrics for each of the components and or sub-assemblies within the final product. 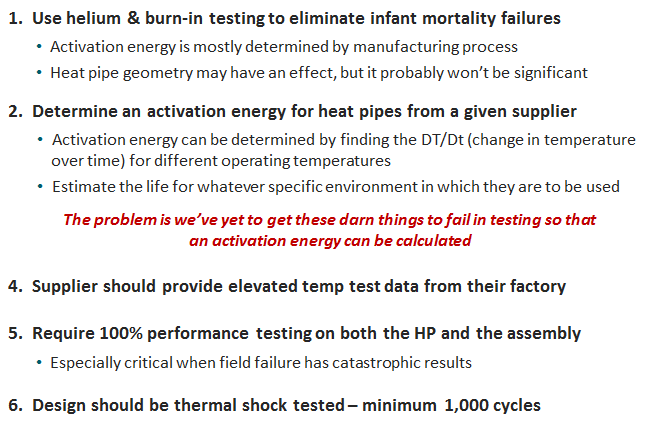 But, does the current thinking about heat pipe reliability make sense? Neither Ross nor I have never seen or heard about heat pipes failing… for reasons other than stupidity or planned obsolescence. 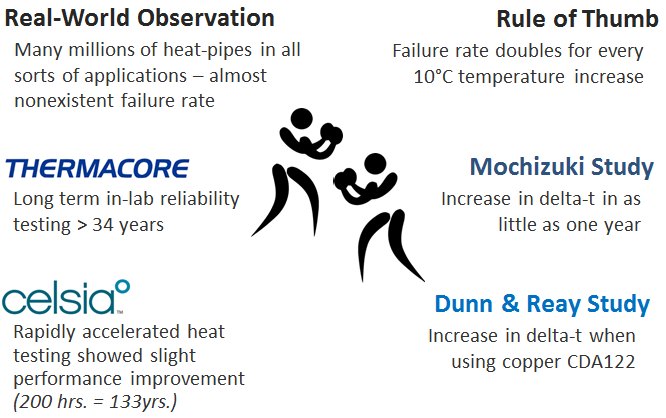 There’s a lot of conflicting market and research data about the mean time between failure (MTBF) of heat pipes. 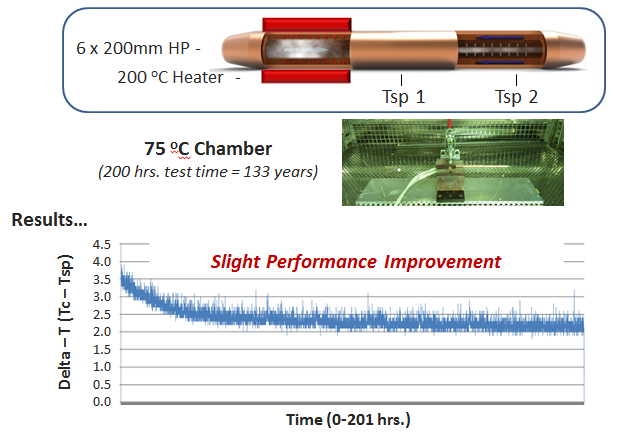 Here’s the conventional reliability assurance approach with heat pipes. 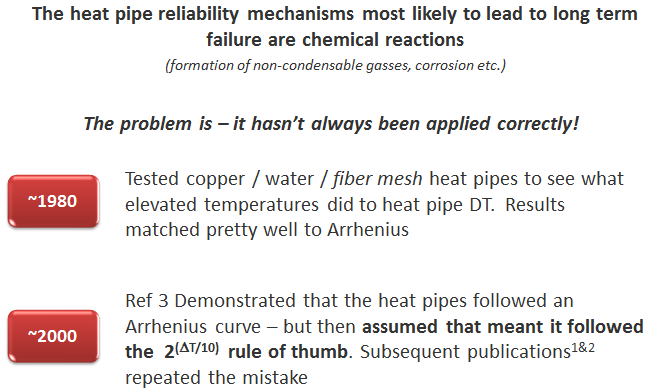 Temperature and failure are correlated; chemists and semiconductor folks believe it, but does a much adhered to rule of thumb apply to heat pipes. Namely, every 10 degree Celsius temperature rise will double the failure rate. In examining past research, it appears that some erroneous assumptions were made. 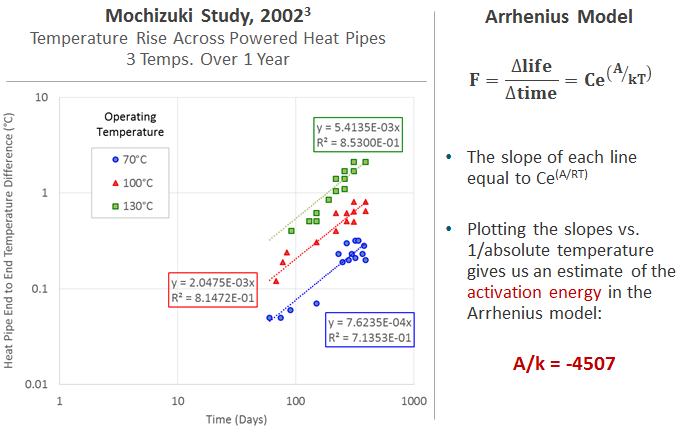 Ross plotted the findings from a heat pipe failure study and showed that they did follow an Arrhenius curve. 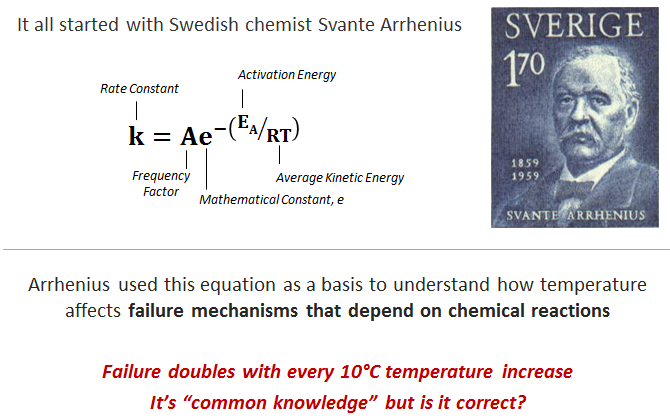 Then he estimated the activation energy; a key portion of the Arrhenius equation. 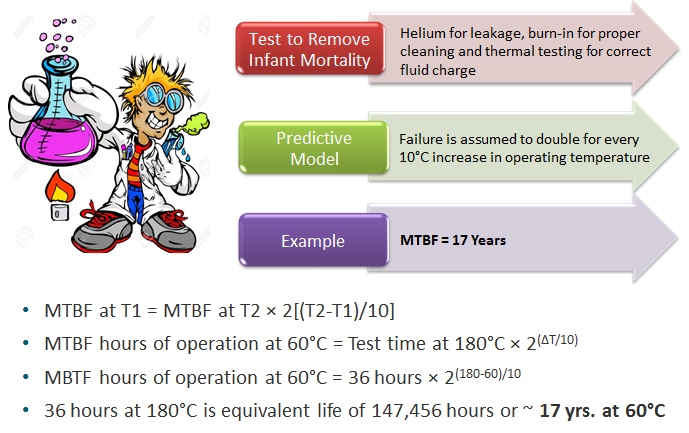 He then used the estimated activation energy of -4507 to determine failure rate predictions at various temperatures. He found that our much believed rule of thumb (double the failure for every 10 deg. C rise) was only true for one point on the graph. 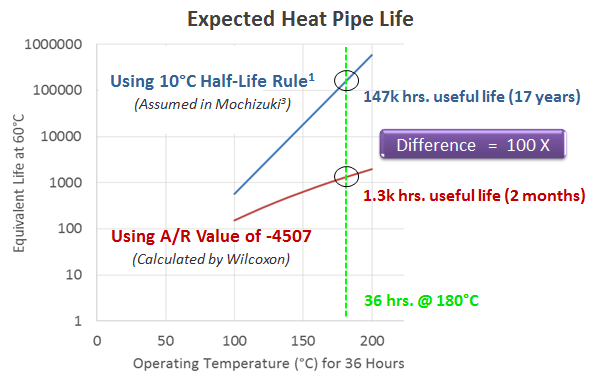 As you can see below, the observations made in the Mochizuki study (that heat pipes follow an Arrhenius curve) should not have lead to the assumption that it followed the half-life rule of thumb. While the blue curve, below, seems to be a better approximation of heat pipe reliability in the field, it’s based on an erroneous assumption. To determine a more accurate predictive test, we need to find a suitable activation energy. The problem is we’ve yet to get the most common type of heat pipes (water, sintered copper, copper) to fail in the lab. 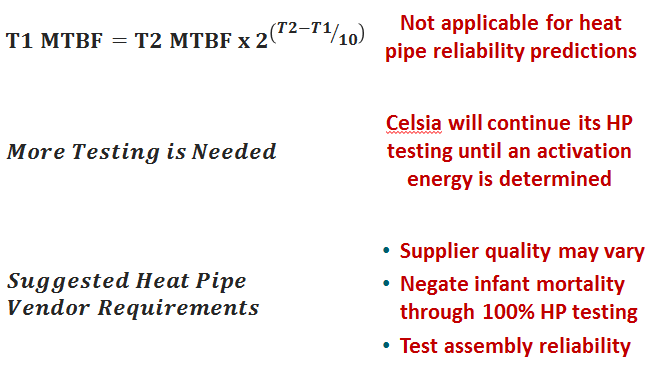 Celsia is continuing its elevated heat pipe testing until we can determine a new activation energy. In the mean time, companies should remember so long as heat pipes are properly manufactured and tested for the most common early types of failures heat pipes should last in excess of 30 years. Here are some simple guidelines. Here’s a specific example of how we test at Celsia. Copyright © 2004 - 2019 Celsia Inc.